Enjoying plenty of activities together is a fantastic way to enhance your elder care routine with your aging parent and support their ongoing health and wellbeing. If your parent is dealing with Alzheimer’s disease it can be daunting to think of continuing with these activities. With proper planning, however, there is no reason that you should not be able to continue having exciting experiences and memorable quality time together even as your parent progresses through the disease. • Keep in mind their abilities. 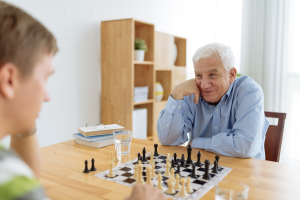 When you are trying to plan activities to enjoy with your loved one, make sure that you carefully keep in mind their abilities, limitations, and challenges. This will help ensure that your parent will actually enjoy the experience and stay safe and healthy. Compare these abilities with the features and amenities of the destination or event so that you can determine if it is plausible. • Consider modifications. Consider modifications that you may be able to make to the event, destination, or way that you experience the activity that will address your parent’s needs. These modifications may enable you to still enjoy the event in a safe, healthy, and meaningful way even if your parent has some challenges. If these modifications include things such as mobility aids, be sure to contact the destination ahead of time to ensure they are available for rent or that they are allowed in the destination. • Think of their “former” life. When making plans for activities to enjoy with your parent, take into consideration the type of life that your parent had before they received their Alzheimer’s disease diagnosis. You can use these details to help you choose the activities that your parent might continue to enjoy now. For example, if your parent was an athlete when they were younger, they may enjoy exercise classes or watching their favorite sport live. A parent who played music may like attending concerts. • Stay familiar. Simply because your parent is progressing through Alzheimer’s disease does not mean that they automatically do not enjoy the same things. Plan activities that are familiar, such as reading the newspaper, taking walks, or watching movies. Even if they do not understand them in the same way, if they still enjoy doing them they are beneficial. These are a great foundation for a routine with you or their elderly health care services provider. • Think small. You do not have to always plan activities that are out of the house or complex. For seniors who are dealing with cognitive decline, activities of daily living can be extremely meaningful. Ask your parent to help you prepare a meal, to set the table, or to work with you to fold a load of laundry. These tasks can stimulate their mind, trigger memories, offer opportunities for sharing and communication, and support a sense of independence, autonomy, and involvement in the world around them. For in-home Elder Care in Arlington TN, please contact the caring staff at Personal Care Services MidSouth today! This entry was posted in Elder Care Arlington TN and tagged Elder Care Arlington TN. Bookmark the permalink.